After rising to over $47 on Monday, crude prices have fallen back to $46.55 this morning. Last Friday, crude prices rose over a dollar, from an opening price of $44.89 to a close of $46.04. Monday continued the gains, and prices closed at $47.07. Today, prices are slipping lower on a lack of fundamental news, shedding roughly 50 cents. Diesel prices are currently $1.5093, and have followed crude prices lower this morning with a .35 cents (.23%) drop below Monday’s closing price of $1.5128. Early morning action pushed prices above $1.52, but markets could not maintain this level for long. Gasoline prices are currently $1.5199. This represents a significant drop of nearly 1.5 cents (roughly 1%) from yesterday’s close of $1.5348, also in response to crude price action. Prices are down on a lack of fresh news affecting fundamentals. 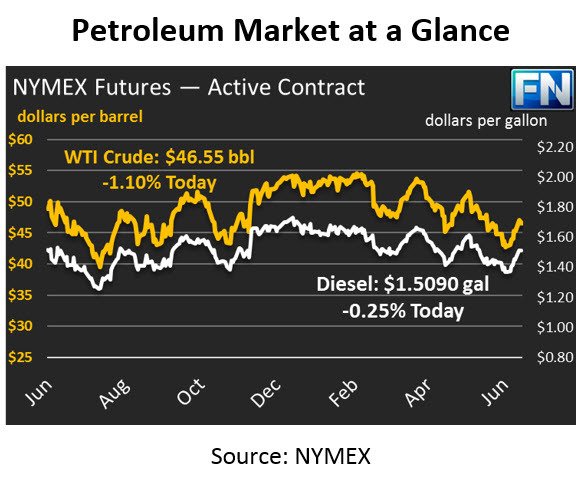 The surge in crude prices to over $47 was mostly attributed to short covering following a long-series of price declines. As the market processes announcements of OPEC production rising to its highest level of the year and Libyan production surpassing 1 million barrels per day (up from just 690 kbpd to start the year), any market enthusiasm seems to have been overrated. On Friday, Baker Hughes announced that rig counts had declined by 2 rigs. This decrease ends the astounding 23-week streak of continuous rig count gains. With crude prices languishing in the mid-$40s, producers are beginning to lose their appetite for more drilling. Markets are now wondering whether the near future holds more rig count reductions, or whether producers will resume their quest for higher production rates. Markets today are weakening in the face of a stronger U.S. dollar. Russia is also putting pressure on the market after announcing that they would oppose any deepening of OPEC-NOPEC production cuts. Russian officials indicated that current cuts are sufficient to balance the market. Market sentiment, on the other hand, is growing increasingly skeptical of the market balance, with high non-OPEC supply chasing somewhat weakened international demand.